Let’s pretend we live in a world where food allergies, dietary restrictions and food-related consequences don’t exist. Your only limitations are your personal tastes and ideology. A gigantic creation consisting of WHOLE sandwiches, pepperoni pizza slices, Bugles, Chex Mix, Crescent Dogs, fruit roll ups, and other assorted snacks. Welcome to the first edition of Would/Would Not Eat, where I tell you if I would ever consider eating ridiculous foods and why/why not. 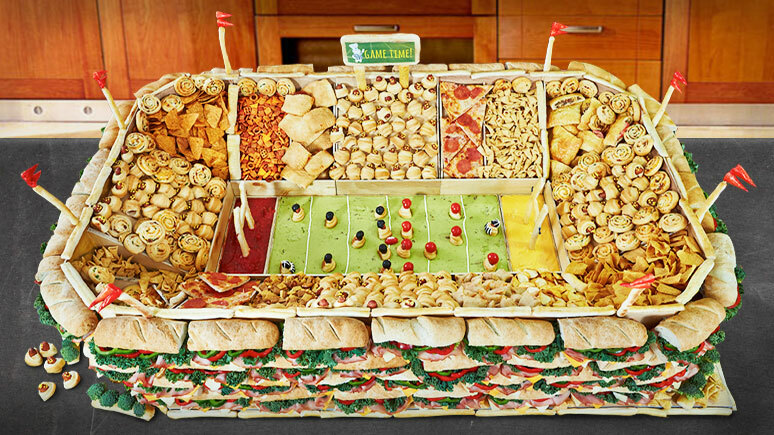 The Super Bowl is this weekend, and to celebrate, the good people at Pillsbury have constructed a stadium completly made out of snack foods. Not only would I eat this, if I weren’t actively trying to lose weight I would make one of my own this weekend. Other than the enormous quantity of food, there is nothing overtly vulgar about this creation (sandwiches, pizza, etc.). This version used store bought guacamole which seems a little cheap considering the sheer magnitude of this undertaking. If you are going to bake your own French bread (albeit from refrigerated dough) for sandwiches the least you can do is mash a few real avocados together. Now you don’t have to travel the world to see amazing examples of architecture for you needn’t look further than the snack aisle at your local grocery store. What about you? Would you eat this? Discuss in the comments if you are so inclined.